Paying for higher education has continued to be a source of anxiety for a large portion of the population. With college tuition costs rising at a rate that far exceeds that of inflation, paying for college without accruing considerable debt is no longer a reality for most students. A survey conducted by Ohio State University in 2015 found that seventy percent of undergraduates in the United States felt stressed about their finances. While the cost of college tuition represents the largest financial hurdle that college students must overcome, the expenses of the college admissions process is enough of a financial burden for many families. In today’s college admissions process, combining high standardized test scores with academic rigor, a high GPA, multiple extracurricular activities, and in some cases, a demonstration of interest, is crucial for admissions to many selective colleges and universities. Unfortunately, every single one of these factors costs money. The SAT and ACT each cost $46, and with writing, the cost increases to $60 and $62.50 respectively. In many cases, students who want to maximize their chances in the admissions process take these tests multiple times, enroll in a personalized tutoring course, or purchase preparation materials. Of course, test preparation and test retakes can be too pricey for low-income families who are already burdened by the other costs of the admissions process. However, for students who can afford it, test preparation can yield significant score increases. 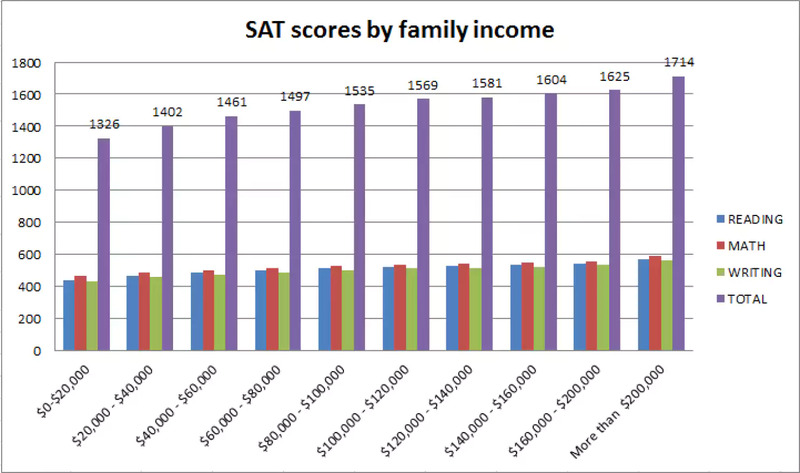 It is no wonder, then, that there is such a distinct correlation between SAT scores and race and income. The College Board’s recent redesign of the SAT and its partnership with Khan Academy to provide free SAT preparation aimed to lessen the score gaps between socioeconomic and racial groups, but the disparities remain apparent. SAT subject tests, although not required by all colleges, demonstrate aptitude in particular school subjects. One test can cost at least $47. Furthermore, taking AP exams not only demonstrates specific areas of academic strength, but they also display academic rigor in an applicant’s schedule. For many universities, the more AP exams a student takes, the more qualified for rigorous college academics he/she is. Students in underserved, often rural school districts, have less access to AP courses, according to a study by the University of New Hampshire. Likewise, in 2016, the Washington Post reported that while AP enrollment has remained high, the amount of schools offering AP programs has decreased. If AP enrollment (and AP success) remains high in affluent, suburban school districts while it decreases in poor, rural school districts, students with the resources to succeed in AP courses will set a high bar in the admission process everyone else, even those without the tools to succeed in AP courses. As long as admissions offices regard AP success as an important factor in the admissions process, wealthy students will continue to dominate college admissions. Application fees by far represent the largest expense in the college admissions process. Selective schools in particular have instituted high application fees to ensure only truly interested students apply. For most college applicants, steep application fees are enough of a deterrent to applying to too many schools. But wealthy students, who often have the best applications, can afford the accumulation of application fees. And when wealthy, highly-qualified students apply to a school “just for the fun of it” or to “give themselves more options”, they crowd the applicant pool and lower the chances of students with actual interest in the school. The increasing selectivity and the ostensible randomness of the admissions process has made it evermore difficult to gain acceptance to selective schools. One can maximize his or her chances of admission by simply applying to more schools, but because of application fees, the amount of schools one can apply to is chiefly determined by income. With a greater ability to gain admission to selective universities, affluent students have a distinctly higher chance at gaining acceptance to top schools. The advantage in the admissions process enjoyed by affluent families has not gone unrecognized. The College Board has attempted to diminish the income and race gap in standardized test scores by subsidizing testing fees and allowing free SAT preparation through Khan Academy. Colleges and universities waive application fees for many low-income and financially burdened applicants. Some schools do not require standardized tests, and many do not take demonstrated interest into consideration. Lastly, many schools practice need-blind admissions; they accept students regardless of their ability to pay. While many accommodations have been made for lower-income, underprivileged students in the college admissions process, more steps need to be taken to put them on equal footing with their affluent counterparts. More awareness of the effect of income on standardized test scores and academic success is a good place to start. Previous article Dear World, We’re Sorry. Sincerely, America.